I wish I could just caption this sketch saying here’s the Fremont Troll, the beloved public sculpture under the Aurora Bridge that always brings a smile to my face. But that would be an incomplete story. These days you can’t go by the quirky Troll without noticing a sad reality: a large homeless encampment located just a few feet away. 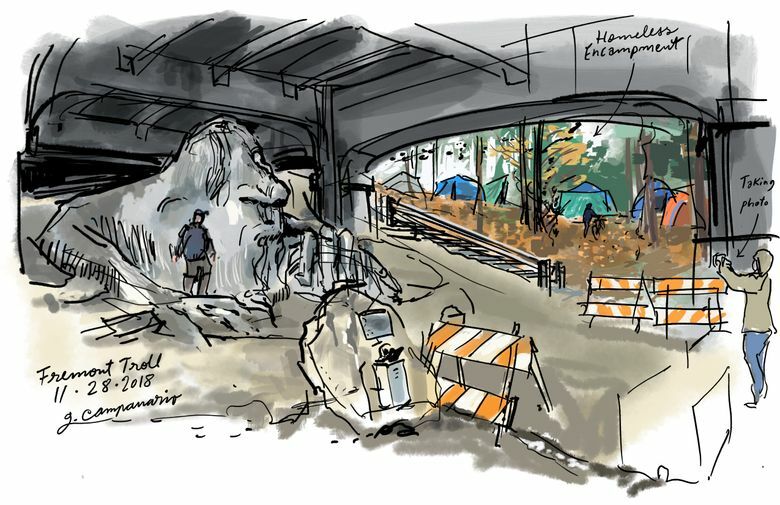 Despite the state of things, the Friends of the Fremont Troll Knoll keep caring for the area as best as they can. This Saturday they’ll have a work party and tree-lighting event that I’m sure will go a long way to lifting everyone’s spirits. The Troll was built in 1990 to bring a greater sense of place to the neighborhood, and it’s one of the most visited attractions in Fremont. I can’t recall a visit when I didn’t see people taking the time to admire it and snap photographs.